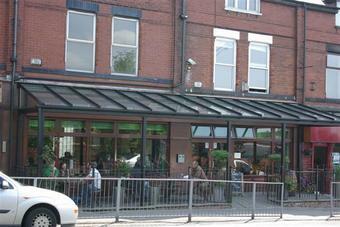 Now the Chorlton Tap with a decent selection of cask ales, just across the road from Chorlton tram stop. Well worth a visit if you're in the area. Lively bar on a Saturday night. Had a Brooklyn Weisse beer which I have never seen anywhere else. However, felt this came at a hefty cost. Couldn't spend too long in here, but what's there is a good selection. First port of call on my recent trip to bohemia. Slightly disappointed with the lack of any stouts or porters. Sampled a pint (name escapes me) which was in fine form but nothing to get too excited over. Food menu looked enticing but I had already eaten. The gang who I was with did eat as I cast my envious eyes on their plates! Relaxed friendly atmosphere with some good songs on the jukebox at a very reasonable sound level. Very handy for the tram station as it's directly opposite. Been going since this bar fist opened as a single unit and Chimay and Erdinger were a rare treat! The longest running of the "new" bars in Chorlton. Always popular. Food has improved of late and their is always a fine select of real ales. Staff can be a bit surley at times, but that's Chorlton for you!